This is another year of outstanding achievements recorded by us…”Friends of Copey”. This specific report highlights several of the key “financial goals” we set for 2017 and successfully met. “Pathway Project 2017” was successfully funded. So far, four of the Learning Center’s best students have been rewarded for their academic success with a trip to the US to spend time at Emory & Henry College. In 2017, Ariana and Fatima with Executive Director, Ana Yancy (pictured) along with Angela traveled to E&H College. Pathway Project Goal $3,500.00 to add to $2,198.00 carryover from 2016. The Total Goal – $5,698.00. The total Actual Amount Raised – $5,263.00. The actual expenses totaled $5,397.35 which left a small shortage of $134.35. A late donation was received allowing this project to enjoy financially another successful year. Miscellaneous Donations have been provided to the Learning Center by independent or non-solicited donors. Typically, these donations support the purchase of school supplies and materials. Estimated at $700.00. Our involvement has proven to be the life-blood that is helping sustain this important mission. We have been consistent, reliable, and loyal to our commitment to help as long as possible and as long as they first help themselves to succeed. We are Learning Center partners and have witnessed the overwhelming results our efforts help support. There are many to thank for the financial success we enjoy each year. Even though we are not established to be a major fundraising operation, we will make every effort to assist the community’s efforts to keep and maintain a viable educational program designed to help the Learning Center. There are several “Friends” who stood extra tall this year as donors. “Thank You”...Stephanie, Kay, Lin, Jones, Tim, Carolee, Martha, and especially George, Eric, and Lisa …and still many others. And, no one should be excluded. You all help make a huge difference in our Financial success of the Learning Center. In truth, there is no small donation…each one is priceless. The next Post will cover many of our “non” Financial Goals and you may expect to see similar positive results. It is amazing to re-visit all of the many things that have been done outside of the financial arena. There is an Army of “Friends” who help this project in ways money cannot buy. I will cover many of these in the next Post. “Friends”…Not A Destination But A Journey! “Friends”, this is my last installment of the photos from the recent trip to Costa Rica although I may slip a few more in over the next few weeks. So, please stay connected. I have enjoyed all of the comments regarding the photos and some of you have even stated you are planning to attend the graduation next November. Believe me…there is more than enough love and affection in Copey for all of us to enjoy. Is it about time for us to make our “New Year’s Resolutions? Photos Below include in order: “Friends of Copey” and the Copey Learning Center united; Dancers during the graduation ceremony performing; Jane with 2017 Graduates Fabriana and Mariana; A view from the mountain of Jaco in the distance (nearly four-hour drive to the Pacific coast from Copey); Beach front in Jaco; Croc’s Resort in Jaco, and one of Croc’s crocodiles. Life in Jaco is almost the opposite to the way of life in Copey. Both places are worth experiencing. Get in touch now with your travel agent to arrange for next year’s graduation. My very best wishes to all “Friends”. This is the third installment of photos documenting the recent trip to the Copey Learning Center. Hopefully, you are seeing the reasons why “Friends of Copey” was first established five years ago and why we continue our involvement. The following photos are: Larry and Cindy Windes receiving the “Distinguished Friends Award” for their work on the new Learning Center design; Ana Yancy receiving the “Outstanding Leadership Award” and signed copy of Felicia Mitchell’s (English Professor at E&H College) book “Waltzing with Horses”. 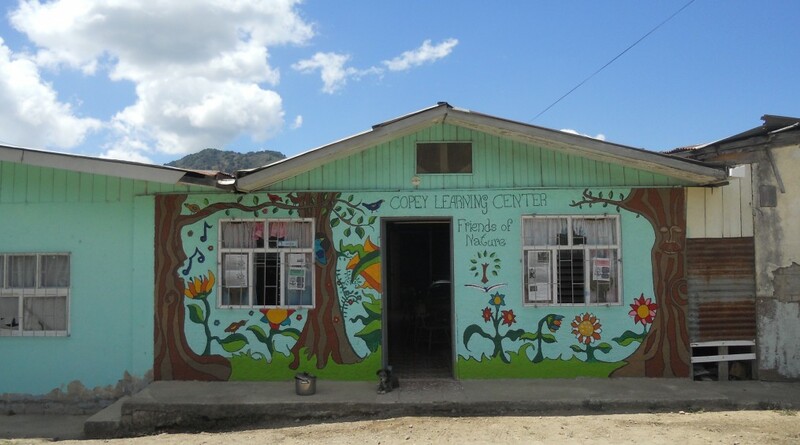 I wish you could picture yourself being at the Copey Learning Center. Seidy, the Founder of the Copey Learning Center with Board President Lorena; Ariana (2017), Celeste (2016), Fatima (2017) Pathway Project students. Lourdes (2018) Pathway Project student candidate. Proudly wearing E&H College colors. Jane and I shared her final hours in the nearby town of Santa Maria before she returned to the USA. She provided the Copey community all she could offer under extraordinary conditions. She was recognized for sharing her time and talents during the 90 days she spent performing outstanding educational and community service. It was an honor to be with Jane on her final day in Copey. We can all learn something from one another and we are never too young or even too old for our lessons. Jane taught us all a few things over the past three months. I am mindful of a few important life lessons I can share. We are still waiting on a decision regarding our partnership application with Building Goodness Foundation. Our sincere hope is that we will hear soon and that the news is good. The Learning Center is officially closed until February but work continues. In 2018, there will be a full list of opportunities to help support the Learning Center. We are nearing the end of our fourth complete year of support and we look forward to the upcoming year with great anticipation.